It shouldn’t be Cup Cake Camp, they should call it Sugar Rush Sunday! We decided to make an event of it, we took the train and walked up to the Queen Elizabeth hotel for around 12:45pm. Plenty of time I figured since the doors opened at 1pm. When we got there the doorman (apparently an honest one not sitting in jail for extorting money from cabbies) informed the “line has already formed.” The “line” I wondered, there’s a line-up for cup cakes?! What have I gotten myself into!? 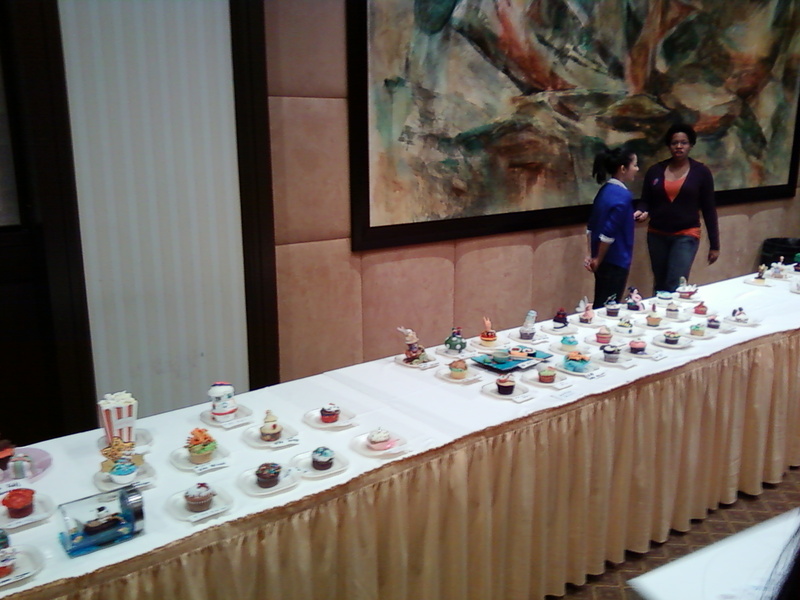 Apparently Cup Cake Camp Montreal is a premier fund raising event, the number of people attending was insanity!!! For cup cakes!!! 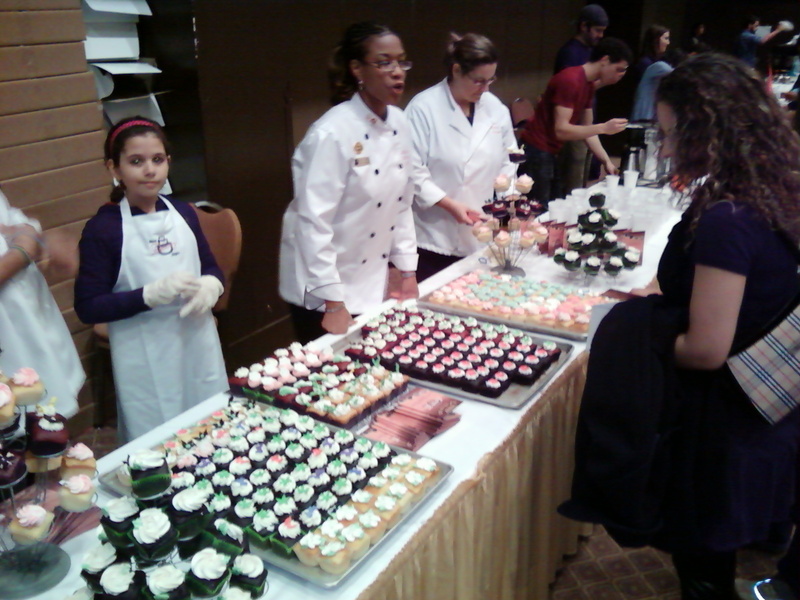 Well, okay for Kids Help Phone and Tablée des Chefs but we were all there to eat cup cakes! My kids had a blast, a sugar rush blast. 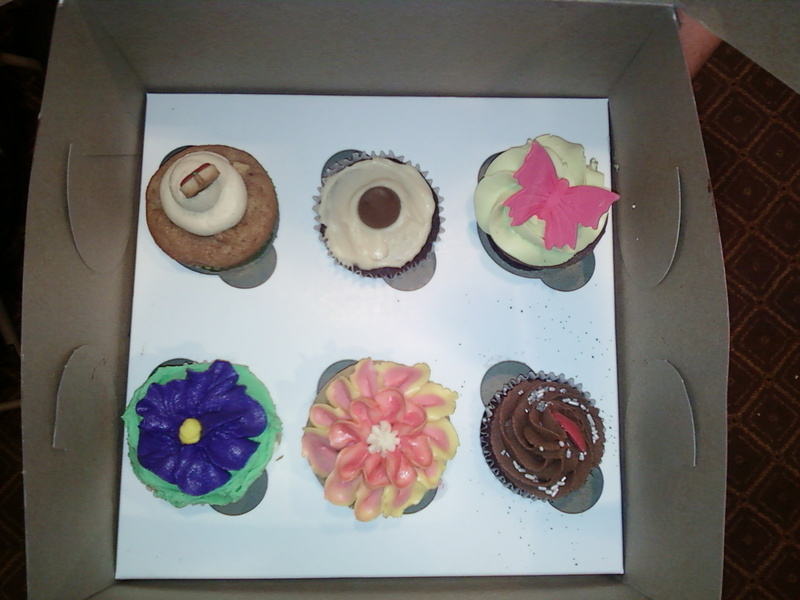 Every cup cake was their favourite, but in the end managed to choose only a couple a bring home and one to eat there. I couldn’t get over the elaborate decorations and designs the chefs were able to create with icing sugar; and the amount of effort that must have gone into making all the cup cakes they donated to this event. Many thanks to the organizers, the volunteers, and all the sponsors for great, unique, event. We got the recipe for Finnish Pancakes from our friend and so Saturday morning we put on our aprons to make breakfast. The breakfast was delicious! Topped with maple syrop and cinnamon we’re definitely going to be making this one again. Soak in the rays, originally uploaded by schultzter. Thomas had a really rough day at daycare the beginning of the month, so I had to leave work early and pick him up. Once we got home he perked up and we had a little snack together and spend some daddy/son time. It was a beautiful late winter afternoon and the sun streamed in through our living room window. It was easy to understand why he wanted to get out of the day care and kick-back at home. It was the first snow of the season that stuck to the ground, so the kids got all decked out in their snow gear for the walk to day care. And presumably there will be much playing in the snow today! It wasn’t the first time it has snowed this fall (check my Twitter stream, I tweeted it) but this is the first time the snow has stuck to the ground. It’s also the first time for Thomas to see snow, we’ll have to see what he thinks when he gets back home this afternoon! Lindsay loves fishies, and we had a lot fun last time Grampa took us fishing so we wanted to do it again. Finally we got ourselves together (more or less) and made it out to Rigaud in time for dinner and then some evening fishing. We only caught two fish and we had to throw the bass back because it was out of season, but Lindsay seemed to have a lot of fun so I’d call the outing a success! Too see all the photos click on the photo above or click here. It was another beautiful day with the temperature just around zero and the sun shining bright. As soon as story time was over we threw (ok, struggled) on the snow suit and headed for the park. Lindsay’s friend Madeleine brought her dad and two brothers along too. Of course the swings were a big hit, but enough snow had melted by now that sand was starting to show. That meant it was time to get dirty and they spent most of the outing underneath the play structure building sand piles! The weather was so nice and Lindsay loves the park so much we couldn’t resist a walk to the park and playing on the equipment. Along the way we ran into her friends Chloe and Madeleine out for a walk with their grand parents and new baby brothers. Of course the swings were a big hit but we did the tour of all the slides and structures several times. Lots of other families were out enjoying the blue skies and warm sun, a first taste of spring and a beautiful summer to come.